← Is cat saliva filthy under Islam? 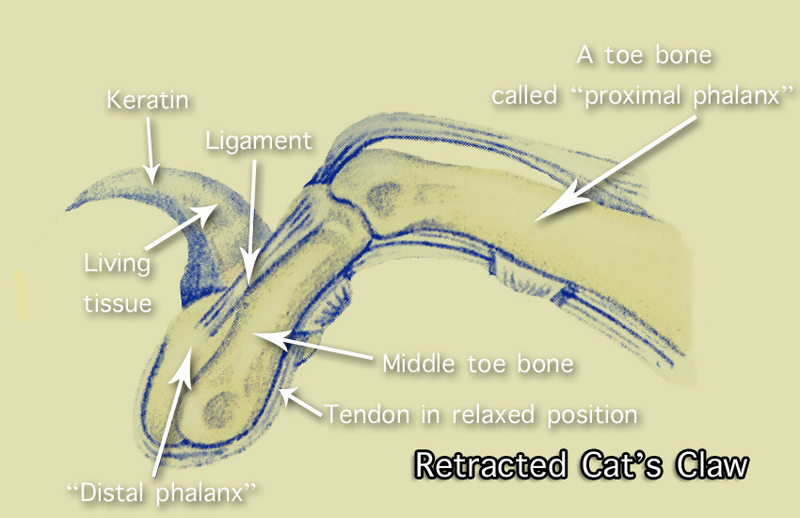 This is a page on the anatomy of a cat’s claw written for children or people who like plain English. A few of the words are from the science of biology. “Nails” are what some animal doctors (vets) call the claws of a cat. This makes claws sound as if they are like the nails of a person. It is wrong to do this because claws are different to nails, except for one thing. A person’s nails and the hard bit of a cat’s claws are made of the same stuff. It is called “keratin”, which is not a living substance. 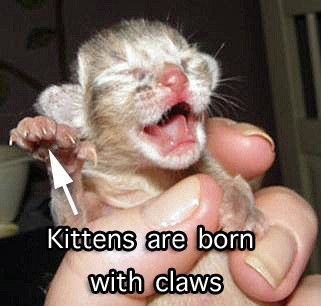 There is also a softer, living, bit in the middle of a cat’s claw that is called “live dermis”. Did you know that the spiky bits on a cat’s tongue, which are called “papillae”, are made of keratin too? They are important in defending a cat from other cats and animals that might attack her and harm her. They help to grab things. A cat’s claws are part of a cat’s toes. As a cat walks on her toes, claws help with movement and running. They are used to scratch surfaces, which is a way for a cat to tell other cats that this is her place. A cat’s claw also helps a cat to stretch. When a cat uses a scratching post she may grab it and stretch her back as well as scratch it. If you buy a scratching post get a big, heavy one as your cat will like it much more. Scratching a post also helps remove the outer layer of the claw, making it new again. You’ll also see a cat scratching herself, sometimes. This helps to remove unwanted objects in her fur and to get rid of an itch. Claws help a cat to climb up and down trees and other things. When a cat jumps up her claws grab the place she is jumping to. This makes the jump safer and it helps her to jump further and higher. A person’s nail is attached to the skin of the finger. A cat’s claw grows out of the last bone of the cat’s toe. This is important. The cat’s claw is completely fixed to the toe. It is part of the bone of the toe and cannot be removed. It has to be firmly fixed like this because it is used so much and pulled so much. It has to be very strong. When a cat is not using her claws they are “retracted”. This means that the claw is pulled into the cat’s toe by a muscle and a tendon so you can hardly see it. This is the normal position for the claw. A “tendon” is tough stuff that connects muscle to bone. Some wild cats don’t retract their claws so much because they need them out a lot to get a grip on the ground for fast running. The cheetah does this. As a cat walks on his toes, claws gets worn down when used, such as walking on rough tracks and so on. Indoor cats don’t usually get a chance to wear down their claws so the cat’s owner should trim them. This is good for the cat and for the person. If a person likes cats they should learn to like a cat’s claws because they are an important part of the cat and they affect how the cat behaves. Click on the link for more on cat anatomy. I have lost the photographer’s name for the kitten. Sorry. Please come forward. This entry was posted in Cat Anatomy, Cat Facts, Cat Facts For Kids and tagged cat anatomy, cat claw, cat facts for kids by Michael Broad. Bookmark the permalink. Great and striking in its simplicity,well done Micheal. To see that diagram of the claw explains it exactly as it is and vets axing off cats toe ends know full well they are cruel. It has to stop.I’ll be sharing this article around too. Thank you for the Facebook Likes. It is very nice of you all. And thank Ruth for spreading the word. As I said, I believe the desired change in culture that accepts declawing as a routine operation is in the hands of kids. Perhaps some of the next generation will decide not to declaw their cats. I think your simple but effective picture and article is going to be a great educational tool for the anti declaws Michael. Thanks Ruth. I hope it helps. The kids are the ones who can change the culture. I have added a like button. Thanks for spreading the word. If the page makes just one child tell his mother not to declaw their cat, it will have been worth the effort. This is good, it starts at the beginning and explains the importance, and function, of the claw in a simple easy to read way, I’m quite sure it also contains information that some people may not already know. I hope it gets seen, not only by children but adults too who hopefully will be surprised at how vital claws are and that they are not just a glorified nail. Well done as always Michael. Thanks Babz. Hope you are well. It had a LIKE immediately on one group! As you said Michael, vets should explain how a cat’s claw is different to a person’s nail and if they had the picture you have used here, on their reception office and waiting room walls, then surely people would understand why declawing is cruel. If I was over in the USA I’d make a poster of your simple but very powerful article and send it to every declawing vet, to put them to shame. I’d like to share this article on all the facebook anti declaw groups as members are always looking for some different ways to educate. I don’t mind if you remove all my comments, if you think it better not to mention declawing here? Great Ruth. Please do use this article. I am glad you like the concept which is to educate people, particularly young people, that a claws are not the same as nails. This is important. One major reason why cat owners accept declawing is because they see it as just surgically removing the “nail”, a profound misconception. I don’t mind the comments referring to declawing (a secondary level reference if you like). Comments in general help as they build a page and make it more visible. I think your article is perfect Michael and it’s up to visitors to comment on that and to add that what you have written can only do the anti declawing campaign a lot of good. I hope my comment might be seen by some people who didn’t know and therefore would be shocked, that cats claws are taken from them, when you had explained just how essential they are to cats. Thanks Ruth. This is a different angle on the problem of declawing. This is a brilliant article Michael and not only for kids because many adults don’t know the importance of a cats claws to them either. If they read it as it is explained in great detail this way, it would surely stop most people from having their cats declawed. I hope a lot of kids read this and share it with their parents, with their school friends too and then when these kids are grown up, hopefully declawing will become history if it hasn’t before then. Thanks Ruth. The idea, as I am sure you have guessed, is to do what a vet should do; explain what a cat claw really is and how important this piece of anatomy is to a cat. I have heard vets describe the claw as a “nail”. This is a subtle way some vets are masking the true nature of the operation and undermining the importance of the claw. I have deliberately avoided the subject of declawing to allow focus on the importance of the claw itself and hope that kids will conclude that declawing is bad. I am always open to amendments. If you think something should be left out or added just leave a comment. I tend to make amendments after publication anyway because sometimes I see things later that are wrong or which can be improved despite my best efforts.